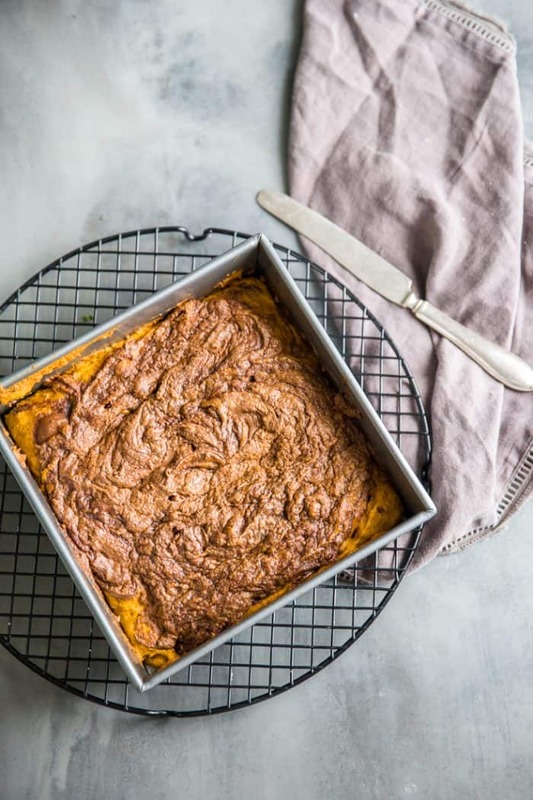 This cake-like pumpkin bars recipe is easy to whip up! The Nutella swirl adds a creamy, sweet decadence to these dessert bars! 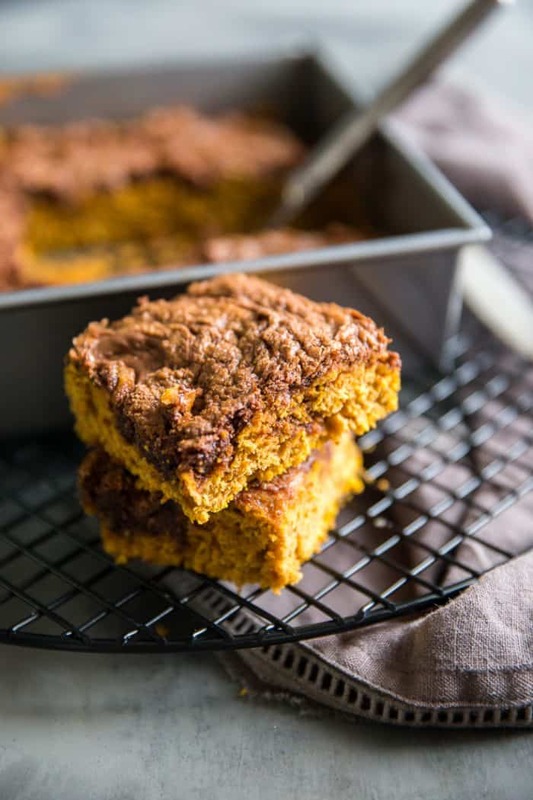 I think the image that pops into mind when we hear “pumpkin bars” are the creamy bars with a dollop of whipped cream on top. 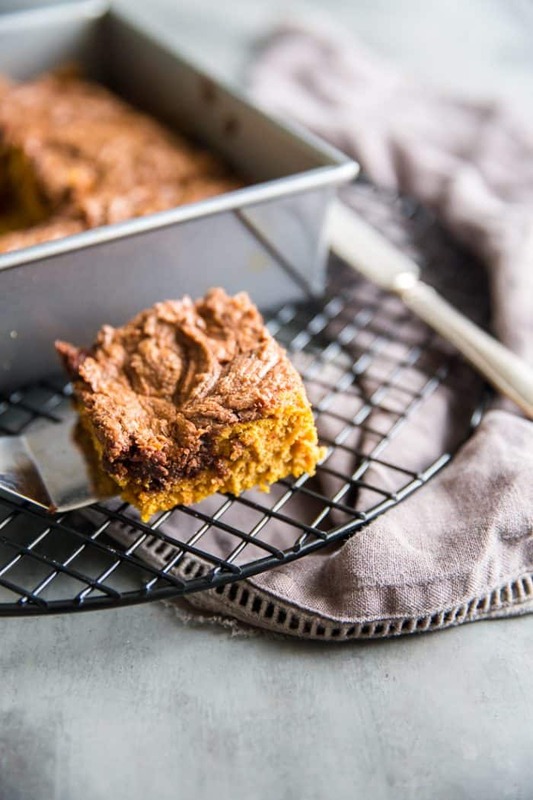 Those are pumpkin PIE bars…where the texture is made to look and feel just like pumpkin pie. These are not pumpkin pie bars. 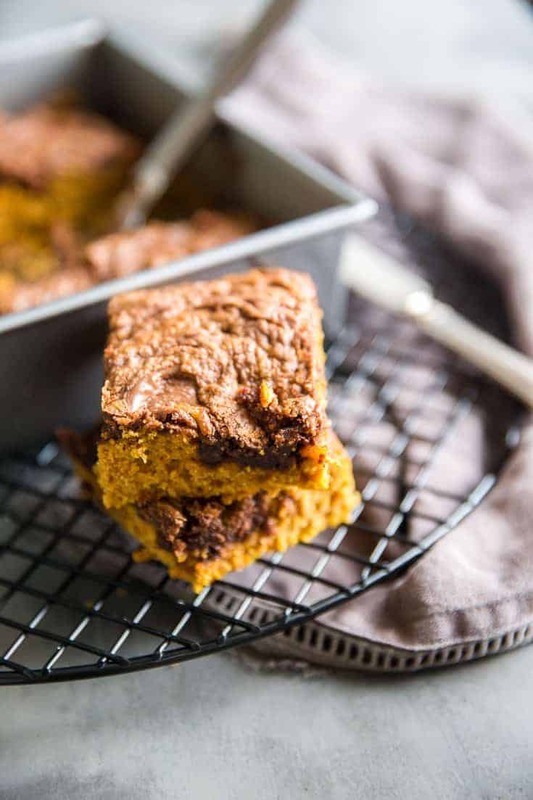 These pumpkin bars are a perfect cross between cake and brownies. They are thick, fluffy with just enough crumb to them. 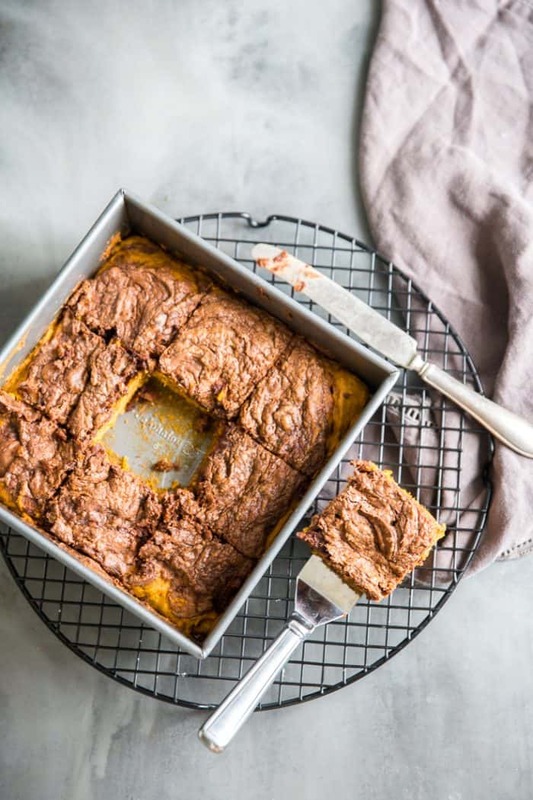 And while I am all for frosting brownies, and cakes, these pumpkin bars have no need for frosting of any kind as they have a generous swirl of Nutella baked right in! The Nutella adds a richness and creaminess that tastes decadent against the pumpkin flavor. WHERE IS THE NUTELLA PUMPKIN BAR RECIPE? If you’d rather skip cooking tips, suggestions, handy substitutions, related recipe ideas – and get straight to the Nutella Pumpkin Bar Recipe– simply scroll to the bottom of the page where you can find the printable recipe card. 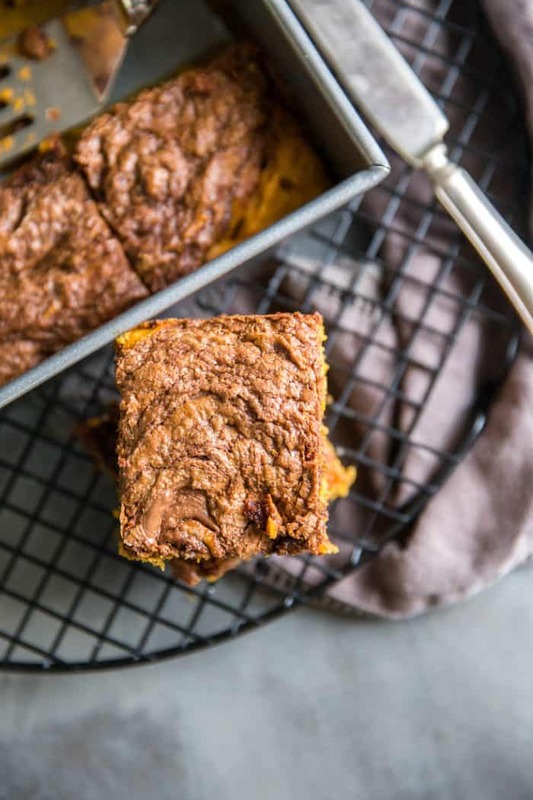 These bars are too tasty to sit around too long, but pumpkin brownies will last if you store them properly. Because this recipe does not have frosting or cream cheese, the brownies do not have to be stored in the refrigerator, they do, however, need to be stored in an airtight container. 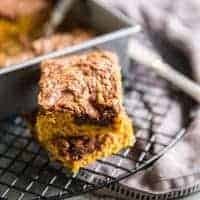 Can These Pumpkin Bars Be Frozen? Yes! You can freeze these bars just like you would freeze any other brownie recipe. Be sure to allow the bars to cool completely. Wrap the bars in plastic wrap and then cover in foil. When you are ready to serve, thaw the bars completely and cut into squares before serving. Want more pumpkin? Try this Layered Pumpkin Coffee Cake, Pumpkin Cream Pies, Pumpkin Roll Poke Cake. 6 tablespoons Nutella Hazelnut Spread. Preheat the oven to 350 degrees. Spray an 8 x 8-inch square pan with non-stick spray and set aside. In a bowl, whisk together the pumpkin, sugar, eggs, and vegetable oil. Combine the flour, baking powder, cocoa powder, cinnamon, salt, and nutmeg in a bowl. Slowly mix dry ingredients into the batter until combined. Pour batter into the prepared pan. Place spoonfuls of the hazelnut spread on the batter and swirl with a knife. Bake bars for 25 minutes or until a toothpick inserted comes out clean. Allow the bars to cool completely. I hope you try it! Thanks for stopping over! Would love to link up! Excellent idea to use whole wheat flour!! I might have to try that too! Yeah! I hope you do! This is soo much better than a pumpkin pie! So very much better! Oh these sound perfect! I adore nutella and pumpkin is one of my favorite baking ingredients! Definitely looking forward to trying this recipe! The flavors went together perfectly! Hope you try them! Thanks for visiting! I just love Nutella and one more reason to use it won’t hurt my feelings. I am going to pin this and make it for fall. Love the two flavors together. I adore Nutella! It is the best thing! I eat it with a spoon! OMG, my mother would love these! I’m printing it out. She is a Nutella freak. I too am a Nutella Freak! Glad I’m not alone! Now these look goooooood! I might put on the half a stone I’ve just lost though if I made these! I convinced myself since they were made with pumpkin, they were light! Thank you! Will be checking your blog out! Nutella gets me every time:-) Yay for pumpkin season coming up really quickly! These bars are to die for!!! I love fall baking! I can’t wait to eat more pumpkin! THank you! I’m heading over to your right now! I sooooo MUST REALLY try this!! Pumpkin and chocolate.. YUM! They were a good combo! Thanks for the party! Thank you! I’m definitely linking up again! Why is pumpkin pie so popular??? Thanks for checking me out and following me! Nutella and pumpkin? i like the way you think Tanya!